Leo Peck creates a contemporary metal and porcelain light fixture. Leo Peck followed a traditional path to learn the craft of pottery. Today his work is anything but traditional. His fascination with architectural design and a love for making functional pieces led him to shift his focus to creating mosaic-like tile tabletops, waterfalls and fireplaces. His outgoing personality is translated into his whimsical and colorful tile designs. 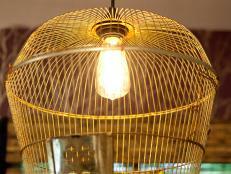 Leo makes a contemporary metal and porcelain light fixture. Note: This project is very complex with an enormous amount of equipment needed: welding equipment, sandblasting machine, kiln. No measurements were provided for the size of the clay tiles or the metal frame. 1. Wedge and cut the clay. Feed the clay through a slab roller and let dry. 2. Cut out five rectangular tiles using a pre-made rectangular "cookie cutter" tool and let air dry to a bone-dry state, about seven days. 3. Sand and water-wipe the edges, then pencil in lines from the stencil. 4. Brush lacquer onto the border edges and the crossbars of the panes. Drizzle on a design within each pane of each rectangle using lacquer from a squeeze bottle and let dry. 5. Spray the clay rectangles with a mixture of 50/50 vinegar and water solution. Wipe with a wet sponge as this will etch the clay where there is no lacquer. When dry, repeat this step two more times. 6. Bisque fire tiles in kiln for 12 hours. 7. Sand off the lacquer residue with sandpaper. Glaze the tiles with green glaze and a paint sprayer. Wear eye protection and a respirator mask while glazing. Glaze fire the tiles. 8. Sand blast the tiles using a sandblasting machine. 1. Measure and cut the steel, then wipe clean with lacquer thinner. Grind the steel ends and the surface. 2. Weld the frame together and drill holes for hanging. 3. Weld metal supports for the tile onto the frame. Grind weld and clean with lacquer thinner. 4. Mix and apply bondo onto the metal frame. 5. Sand the metal frame and wipe clean with lacquer thinner. 6. Spray with a primer, then with an automotive coating and let dry. Sand lightly. 7. Spray desired paint color onto frame. 8. 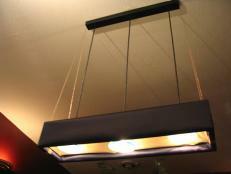 Mount lighting brackets and insert light. 9. Set the rubber-mounting brackets. 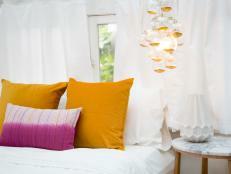 Disguise an existing light fixture by building a fabric-covered enclosure for it. 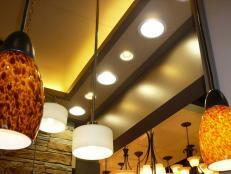 Craft the perfect fixture to light up any space with this simple and trendy DIY pendant lamp. 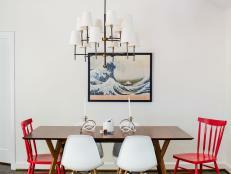 Make your dining room shine without breaking the bank. Winter is coming! 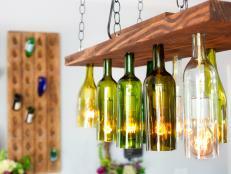 Combat the dark, dark nights with these amazing lighting DIYs even the most clueless crafters can handle. 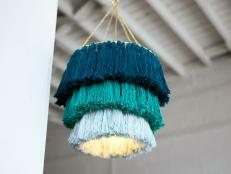 Why splurge on a Bohemian pendant light when you can knot one up yourself. Explore your options for modern bathroom lighting, and get ready to create a sleek and contemporary bath space in your home. 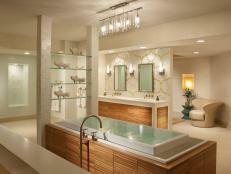 Get all the info you'll need on bathroom lighting fixtures, and prepare to add stylish illumination to your bath space. Get all the info you'll need on brass bathroom light fixtures, and get ready to install stylish and durable lighting in your bath space.